May it be rigorous exercise, muscle tension, inflammation, chronic injury, repetition of movement, constant sitting or even just age, our fascia becomes tight and wound, not allowing us full range of motion and sometimes causing us pain. Most do not realize that limitations in movement are a direct result of taut, dehydrated fascia. This total body stretch is performed by a certified Fascial Stretch Therapist and has been proven to increase flexibility, reduce aches and pains, and improve athletic performance while making your workouts more effective. FST is very different than what we think of as traditional stretching. By taking the client through a series of functional movement patterns, Fascial Stretching actually increases blood flow to the fascia. This hydrates the tissues and facilitates healing. Traditional stretching or bodywork typically only works the injured muscle or tissue, while FST engages the entire neuro-myofascial system by targeting muscles as well as their neighboring joints, ligaments, tendons, and bones. Fascia is one of the most heavily innervated tissues in the body. When the Fascia is taut, it can cause pain and put pressure on corresponding joints. Clinic studies have shown FST can increase flexibility by up to 52% in just one session. Athletes in a FST program have been found to recover more quickly between training sessions and gain an improved active range of motion than with other stretching methods. FST helps with proper body alignment and posture, increases circulation and energy, and improves muscle, nerve, and joint function. FST is a crucial form of body therapy, as there is no supplement or medication that helps improve the state of fascia in the body and exercise alone does not optimally balance, align, or improve fascia. During a FST session, a certified therapist moves the body in undulating spiral diagonal patterns known as stretch waves, paired with traction to access the joint capsule, the deepest level of fascia. Breathing is synchronized with stretch waves for greater efficiency and an additional therapeutic effect. This therapy is generally pain-fee, thus allowing your body to be in a fully relaxed state. Contributing to added benefit and no residual soreness.Clients stay fully-clothed and remain passive as the therapist performs the assisted stretches. There is no use of massage oils or creams. Clients will leave a session feeling renewed and relaxed. Gym Integrity offers FST in 60 minute sessions. Note: We recommend arriving 10 minutes prior to your appointment to allow adequate time to prepare for your session. Please wear comfortable clothing that you can move freely in, such as workout clothing. After your session, you will notice that you feel better overall, stand taller, have less pain, and are more flexible. József was trained by the founders of the Stretch to Win Institute, Chris and Ann Fredrick. These two have been leading the industry in Fascial Stretching for more than two decades. Jozsef received his certification in May of 2015 and is currently the only Fascial Stretch Therapist in Central Oklahoma. 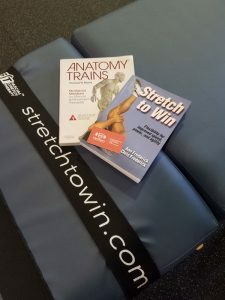 With an extensive background in sports performance, strength and conditioning and olympic lifting, Fascial Stretching was a perfect fit for to help his athletes achieve their performance and wellness goals. Set up an appointment and get stretched! !